(CN) – The Trump administration announced Thursday that it is moving to vastly expand offshore drilling from the Atlantic to the Arctic oceans, including opening up federal waters off the coast of California for the first time in more than three decades. The proposal by the Interior Department for a new five-year drilling plan is the latest move by President Donald Trump to remove restrictions that he has said wrongly prevented energy companies from tapping into U.S. resources. “Previous administrations took 94 percent of the outer continental shelf [energy resources] and made it off limits for energy development,” Interior Secretary Ryan Zinke said Thursday. “Look at the numbers in 2008. It was a banner year. The Interior was the number two revenue generator in this country. We made $18 billion alone in offshore drilling. In 2016 that number dropped to $2.6 billion. We lost $15 billion in revenue a year,” Zinke said. The proposal is sure to provoke strong resistance from states that have historically opposed such drilling, arguing the activity poses a threat to the tourism and commercial fishing industries on which they rely. Already the nation’s third largest oil-producing state, California officials quickly denounced Trump’s plan Thursday. Prominent politicians and environmental groups said the unprecedented plan to undo Obama-era protections and offer six new leases off California’s coast to oil and gas companies is ripe for disaster. Gov. Jerry Brown and California Attorney General Xavier Becerra, who have bitterly opposed Trump’s effort to repeal clean air and other environmental protections, signaled they will go to court to protect California’s coastal communities and wildlife. Brown said California, Oregon and Washington state would “do whatever it takes” to stop the “reckless, short-sighted action” by Trump. 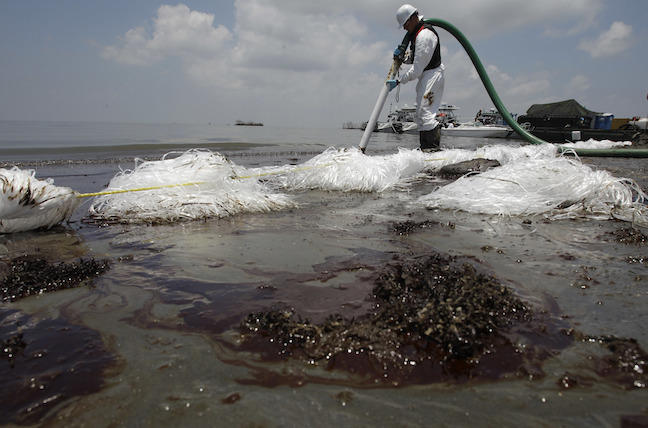 “They’ve chosen to forget the utter devastation of past offshore oil spills to wildlife and to the fishing, recreation and tourism industries in our states. They’ve chosen to ignore the science that tells us our climate is changing and we must reduce our dependence on fossil fuels. But we won’t forget history or ignore science,” Brown said in a statement. “Our state has banned offshore drilling for a reason: because we don’t want it and because we know what happens when it goes wrong. We are evaluating all of our options to protect our state’s pristine national resources,” Becerra said in a statement. But the Interior Department argues not tapping offshore energy resources is simply shortsighted. The proposal lays out a plan for 47 potential lease sales. Of these, 19 areas for lease are located off the Alaska coast, and 12 are in the Gulf of Mexico. The department foresees seven lease sales in the Pacific region, comprised of six off the California coast, and one that will be split between waters off the Washington and Oregon coasts. There have been no sales in the Pacific Region since 1984. More than two dozen offshore oil platforms dot California’s famed coastline between Santa Barbara and Orange County, though no new offshore operations have opened in state waters since the disastrous Santa Barbara oil spill in 1969, which remains the third largest oil spill in U.S. waters. Most of the remaining active drilling sites off California’s coast are in federal waters. In 1994, then-Gov. Pete Wilson – a Republican – signed the California Coastal Sanctuary Act, which barred the state from issuing new offshore leases. Denver-based Venoco decommissioned its platform near Santa Barbara in 2017, and will be the first oil rig removed from California waters since Chevron removed four of its massive platforms in 1996. The Obama Administration held 11 lease sales. The Carter administration, 36. The Interior Department proposal is subject to a 60-day public comment period. Zinke said federal regulators will also be consulting with state officials before any specific drilling program is rolled out. “There’s a clear difference between energy weakness and energy dominance. Under Trump, the U.S. will offer the strongest energy policy and we will be the strongest energy superpower. We certainly have the assets to do that,” Zinke said. Kate MacGregor, Interior’s deputy assistant secretary for land and minerals management, told reporters participating in a conference call that she anticipates vigorous opposition to the proposal. She didn’t have long to wait. “Just last year, more than a million Americans voiced opposition to drilling in the Arctic and the Atlantic. There is overwhelming opposition to oil and gas exploration in the Pacific and widespread support for protecting key areas of the Gulf of Mexico that are critical to the livelihoods of coastal communities,” Jones said. “If a spill were to occur [there], the nearest major port, the Port of Dutch Harbor [near the City of Unalaska, Alaska], would be 1,300 miles away by boat. Even after responders arrive at the remote spill site, clean up attempts may be hindered and safety jeopardized by intense storms, high waves, sea ice, seasonal darkness and volatile conditions,” Jones said. The American Petroleum Institute lauded the plan and brushed off such concerns. He went on to cite a study by Pricewaterhouse Coopers showing natural gas and oil development added 10.3 million jobs and $1.3 trillion to the U.S. economy in 2015. “The administration’s new offshore leasing plan will give our nation the ability to access our vital energy resources to help meet growing domestic and global demand while helping to supply affordable energy for consumers, manufacturers, and businesses,” Milito said. Republican senators Bill Cassidy and John Kennedy of Louisiana agreed. The Sierra Club said it is also examining its legal options in wake of Thursday’s announcement. It and other environmental groups sued in May over Trump’s executive order meant to spur new offshore drilling operations in the Atlantic and Arctic oceans. “Millions of Americans have raised their voices to send a message, loud and clear, that they do not want offshore drilling off our coasts, but rather than listen to the people they are supposed to work for, Trump and Zinke are listening to the industry that’s bankrolled their campaigns and filled their administration,” said Michael Brune, Sierra Club executive director, in a statement. California Assembly Speaker Anthony Rendon meanwhile urged California Republicans to speak out against the expansion of offshore drilling. “The coast, tourism and fishing are vital to the California economy – and our economy is vital to U.S. success. California Republicans must join in opposing dangerous Trump drilling plan,” Rendon tweeted.